Despite a nationwide network of more than 4,000 degree-granting colleges and universities in the U.S., student college choice remains a largely localized phenomenon. In fall 2016, 80% of the approximately 2.2 million recent high school graduates who were first-time college enrollees selected a postsecondary institution within their home state. This makes economic sense. States incentivize in-state college enrollment by subsidizing public higher education to keep tuition substantially lower for residents, compared to non-residents, and through financial aid programs designed to retain their academically high-achieving students. But states demonstrate great variability in the share of students who remain in-state or out-migrate to attend college. 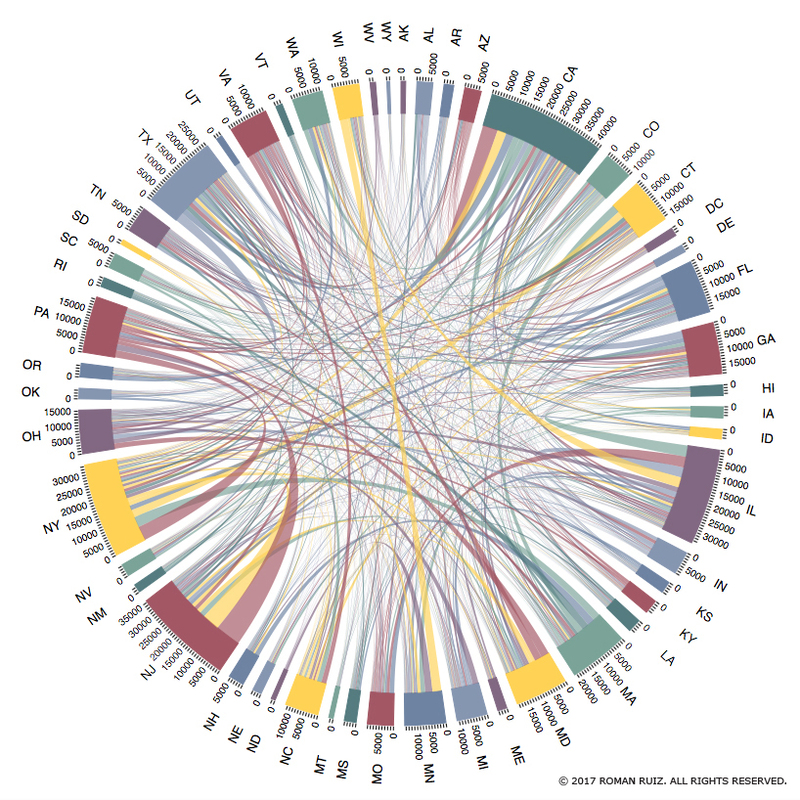 The following visualizations highlight differences in the geographic mobility of each state’s residents when making their college choice. How does in-state college enrollment vary by state? 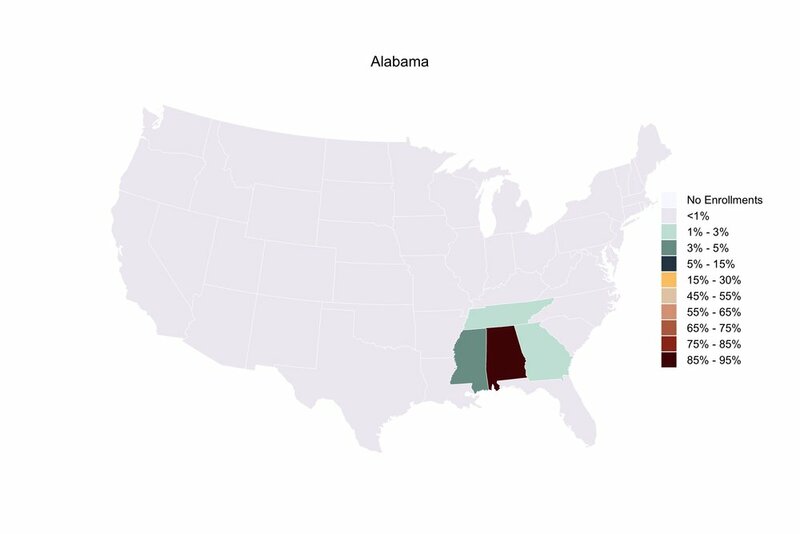 The map below reveals that Southern states generally exhibit the highest rates of in-state college enrollment. 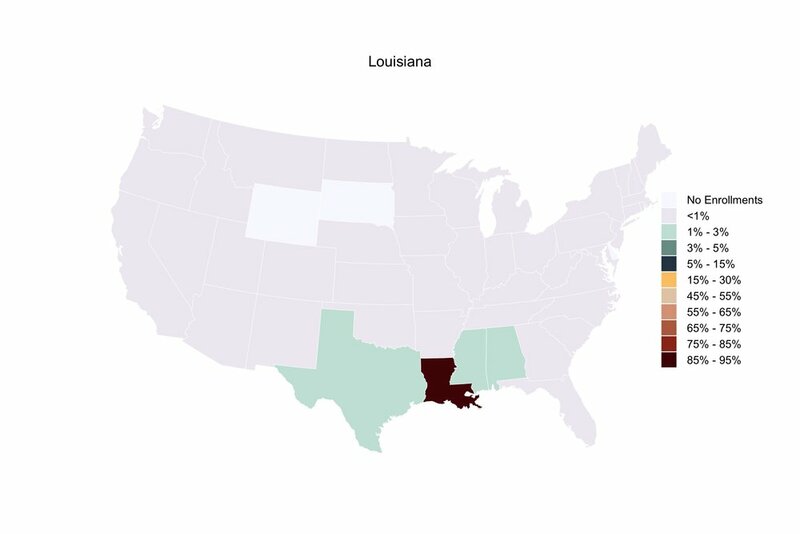 The states with the largest shares of in-state college enrollment among their residents are Mississippi (93%), Utah (91%), Louisiana (90%), Oklahoma (89%), and Arkansas (89%). For these states and others shaded in burgundy, college out-migration is the rare exception to the rule of in-state college enrollment. On the other hand, states in the Northeast typically exhibit the lowest rates of in-state college enrollment, suggesting their residents exercise greater geographic mobility when making their college choice. The states with the smallest shares of in-state college enrollment among their residents are the District of Columbia (18%), Vermont (49%), New Hampshire (52%), Connecticut (53%), and New Jersey (57%). Source: Integrated Postsecondary Education Data System (IPEDS), Spring 2017, Fall Enrollment (EF) Survey. Notes: Calculations include all first-time degree/certificate-seeking undergraduate students who graduated from high school in the past 12 months and attend a U.S. degree-granting postsecondary institution (i.e., awards associate degree or higher) that participates in Title IV federal financial aid programs. 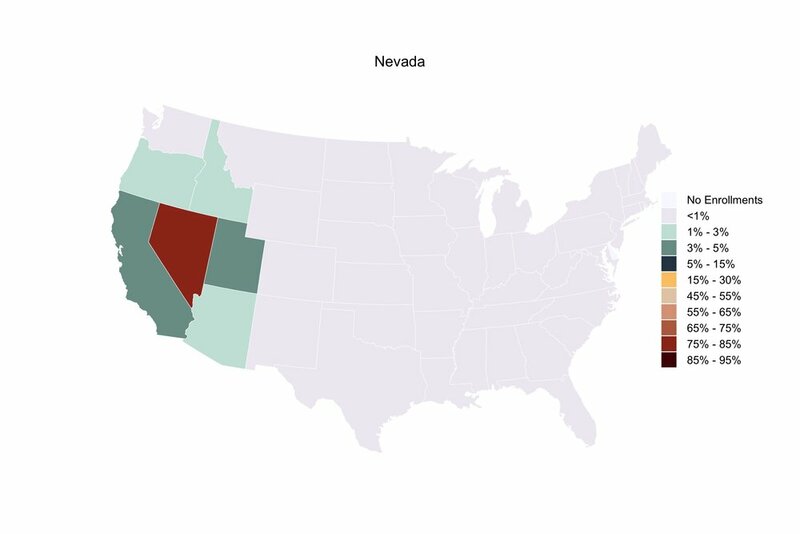 Where do out-of-state enrollees go to attend college? Short answer: Not far. 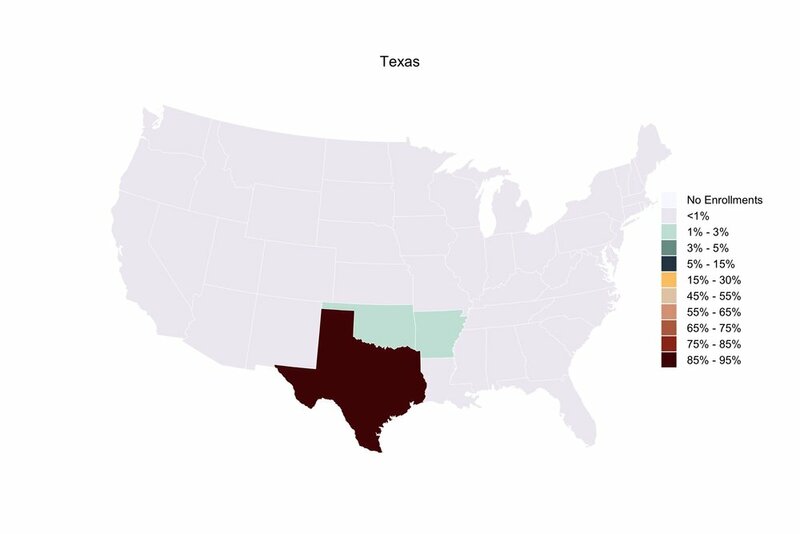 Though they represent the minority of all college-goers, the majority of out-of-state enrollees choose a college located in a geographically bordering state. As an example, while 82% of Georgia’s recent high school graduates who were first-time college enrollees remained in-state, another 10% selected a college or university in a neighboring state (i.e., Alabama, Florida, North Carolina, South Carolina, or Tennessee). Overall, only 8% of college-going Georgians migrated beyond a bordering state to attend college. These largely localized college enrollment patterns are presented in the map gallery below. 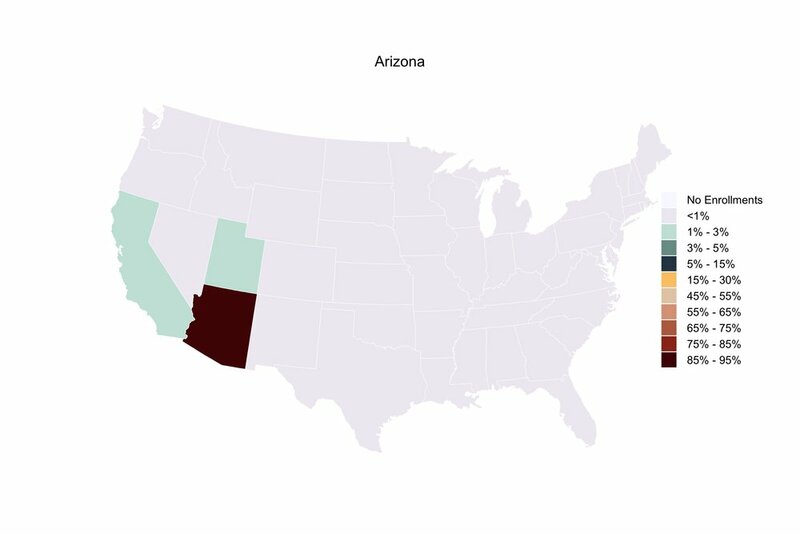 By visually inspecting the geographic mobility of first-time college enrollees, a clear pattern emerges. In general, the highest concentration of states’ college-going residents are found to remain in the state of residence (warm colors), followed by neighboring states (cool colors), and then only minimally represented in non-bordering or geographically distant states (light grey), or not at all (lightest grey). Most states’ college-going residents are substantively represented in only a handful of states, clustered primarily in their home state and to a lesser extent in neighboring states. Twenty states have residents represented at colleges and universities in all 50 states and the District of Columbia, whereas the remaining 31 (including the District of Columbia) lack geographic representation in at least one state. The District of Columbia, South Dakota, and West Virginia exhibit the lowest levels of overall geographic representation nationally, with no college enrollments in 9 different states, respectively. Some states, however, defy the typical geographic mobility patterns in their residents’ college destinations. For example, in fall 2016 more than 3,000 Californians and 1,500 Floridians enrolled in a college or university located in New York state, representing 1.2% and 1.4% of first-time college enrollment among California and Florida recent high school graduates, respectively. In addition, residents of Mid-Atlantic and New England states demonstrate an affinity for migrating south to attend Florida colleges. Between 1% and 2% of college-going residents of Massachusetts, Vermont, Maine, Delaware, Maryland, Rhode Island, Connecticut, New Hampshire, New Jersey, and the District of Columbia enrolled at a Florida college or university in fall 2016. 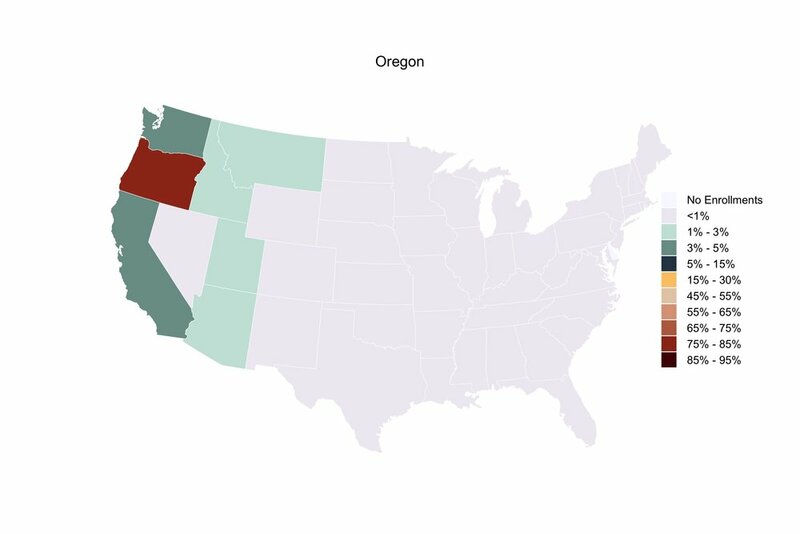 Despite the geographic distance, at least of subset of these states’ residents were able to overcome spatial and economic constraints when making their college choice. The District of Columbia also stands out as a geographic outlier in terms of its residents’ college destinations. Despite representing the smallest number of college-going high school graduates of any state—approximately 2,500—District residents exhibit tremendous geographic mobility in where they attend college. With only 18% of residents remaining in-district to attend college, more than 4 out of 5 choose to enroll out-of-district. 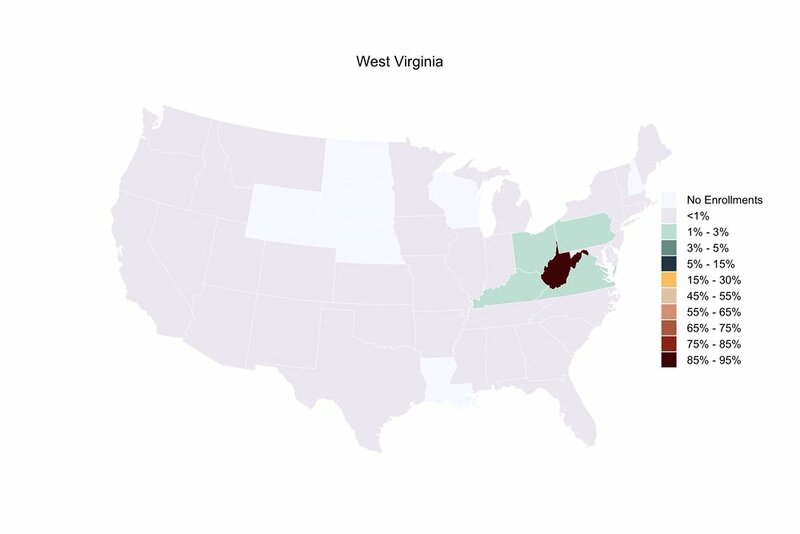 In fall 2016, approximately 14% of District residents enrolled in a Virginia college or university; 10% each in Pennsylvania, Maryland, and North Carolina; 6% in New York; and 3% each in Massachusetts and Georgia. The District of Columbia is a case study in financial aid policy that promotes geographic mobility in the college choice process. Established by an act of Congress in 1999, the District of Columbia Tuition Assistance Grant Program (DCTAG) provides eligible District residents a subsidy to attend any of more than 300 participating colleges and universities nationwide at a substantially reduced price, effectively allowing District residents to pay ‘in-state tuition’ at out-of-district institutions. And research suggests that DCTAG was effective in increasing District enrollments at out-of-district participating colleges. 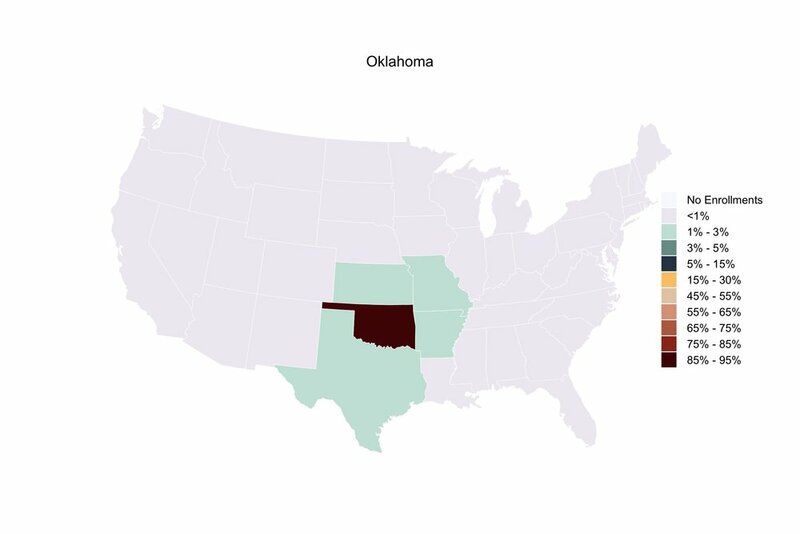 For more insights on the geographic mobility patterns of each state’s first-time college enrollees, scroll through the map gallery below. The geographic mobility of high school graduates poses a potential challenge (or reward) for states, depending on whether their most academically competitive students choose to remain in their state of residence or migrate outside their home state to attend college. The following visualizations provide an updated snapshot of the out-migration of first-time college enrollees in fall 2016 who attended an elite U.S. college or university. The phenomenon of ‘brain drain’ occurs when highly educated or talented individuals emigrate, taking their human capital (and related economic productivity) with them. For the purpose of these analyses, ‘brain drain’ is operationalized as the number of students who gain admission to and enroll out-of-state at any of the country’s approximately 90 ‘most competitive’ colleges as classified by Barron’s. According to Barron’s methodology, the ‘most competitive’ U.S. colleges typically require the following: (1) high school class rank in the top 10% to 20%; (2) grade averages of A to B+; (3) median college admission test scores between 655 and 800 on the SAT and 29 and above on the ACT; and (4) small share of applicants admitted, typically fewer than one-third. Examples of Barron’s ‘most competitive’ colleges include Ivy League universities (e.g., Princeton University), large public flagships (e.g., University of California at Berkeley), and small private liberal arts colleges (e.g., Colby College). The country’s ‘most competitive’ colleges are not distributed equally across space. Instead they are primarily clustered in the Northeastern U.S. and West Coast. 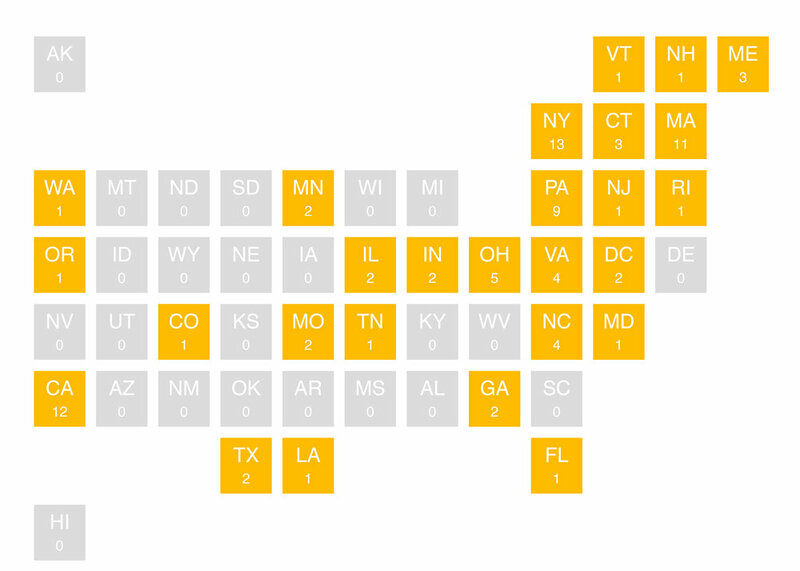 The states with the greatest number of ‘most competitive’ colleges are New York (13), California (12), Massachusetts (11), and Pennsylvania (9). On the other hand, nearly half of U.S. states (24 out of 51, including DC) do not have a ‘most competitive’ college located within their boundaries, particularly states in the South Central and Mountain regions. Data Source: Barron’s Profiles of American Colleges 2016. Notes: The total number of ‘most competitive’ colleges included in analyses is 89 after excluding the U.S. Service Academies and the School of General Studies at Columbia University, as Columbia University is already included on Barron’s ‘most competitive’ list. 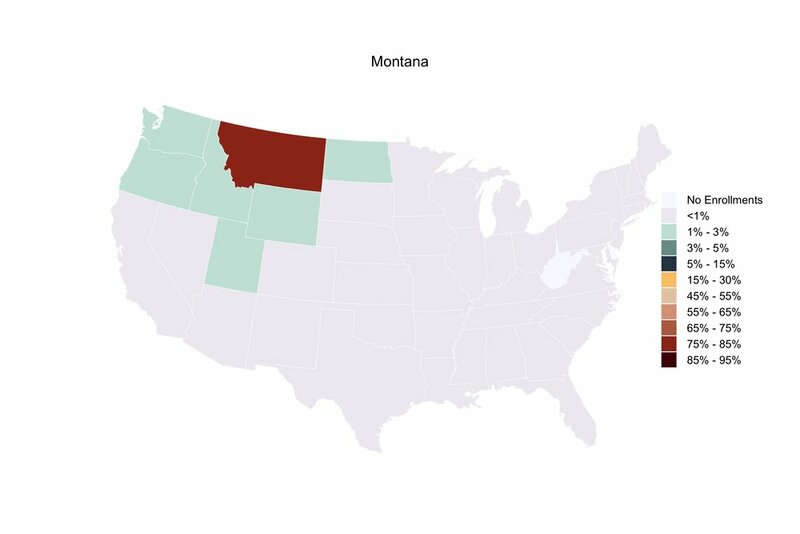 The total number of ‘brain drain’ leavers varies widely across states, ranging from a low of 29 in North Dakota to a high of 7,348 in New York. Other states with the greatest number of ‘brain drain’ leavers after New York include: California (7,307), New Jersey (6,434), Illinois (4,286), and Massachusetts (3,813). So-called ‘brain drain’ leavers pose a potential risk to a state’s economic and intellectual outlook, as high academically achieving high school graduates choose to take their human capital (e.g., skills, productivity) elsewhere. Interpreted from another lens, the low out-migration numbers suggest that some states are substantially underrepresented in elite U.S. higher education. 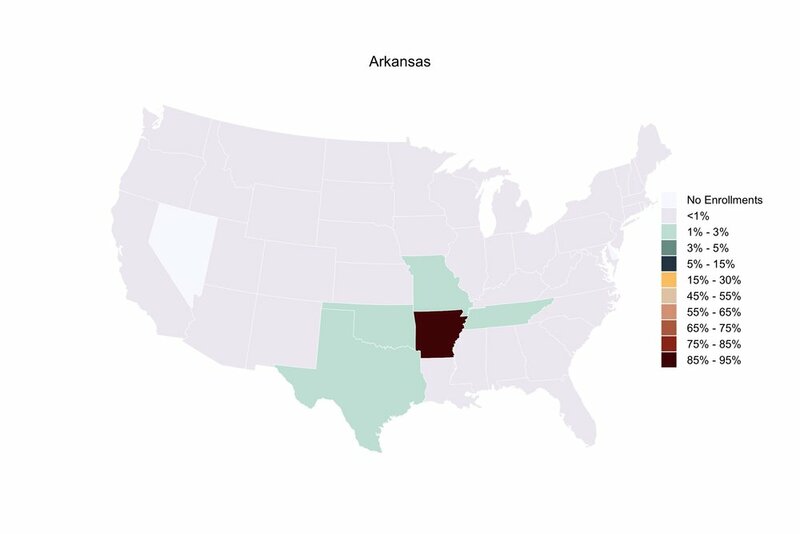 For example, in fall 2016 Arkansas and Mississippi had only 159 and 121 high school graduates, respectively, attend a ‘most competitive’ U.S. college. Though substantial ‘brain drain’ is not optimal for states, some level of geographic mobility to elite higher education is suggestive of college access and educational opportunity for individuals from rural and geographically-distant states. Data Source: Integrated Postsecondary Education Data System (IPEDS), 2016 Fall Enrollment Survey. Notes: State residency is determined at the time of college admission. 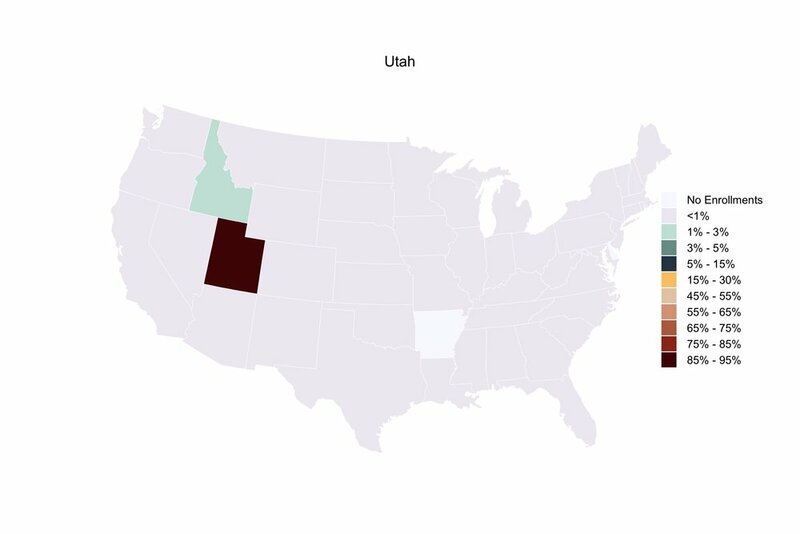 Approximately 500 first-time college enrollees at a ‘most competitive’ college in fall 2016 were excluded from analyses due to unknown state residency status. This number reflects less than 0.5% of all ‘most competitive’ college enrollees in that year. Analyses are inspired by Faggian & Franklin (2014) Human Capital Redistribution in the USA: The Migration of the College Bound. The total number of ‘brain drain’ incomers also varies widely across states. For the 24 states without a ‘most competitive’ college (a mechanism that can draw in the most academically competitive high school graduates), the number of ‘brain drain’ incomers is zero. For the 27 states with at least one ‘most competitive’ college, the number of ‘brain drain’ incomers ranges from a low of 239 in Washington to a high of 9,700 in New York. Other states with the greatest number of ‘brain drain’ incomers after New York include: Massachusetts (8,234), Pennsylvania (6,278), California (5,431), and Ohio (3,531). So-called ‘brain drain’ incomers could prove to be advantageous for states, as they acquire highly skilled individuals who may contribute to their local economy and intellectual vibrancy. Combining a state’s total number of ‘brain drain’ leavers with incomers yields a net count of how many of the country’s most academically competitive (and geographically mobile) high school graduates it either gained or lost. States with the greatest overall net gain in ‘brain drain’ incomers include: Massachusetts (4,421), Pennsylvania (3,401), the District of Columbia (3,096), New York (2,352), and Ohio (2,166). 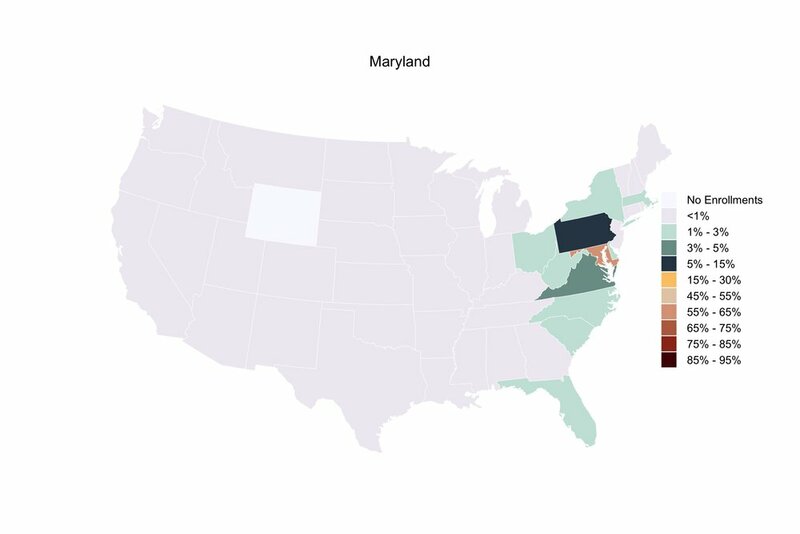 Mid-Atlantic states generally had positive net gains in ‘brain drain’ incomers, likely a function of their robust elite higher education infrastructure (Figure 1) and the geographic proximity and relative ease of travel among these states. 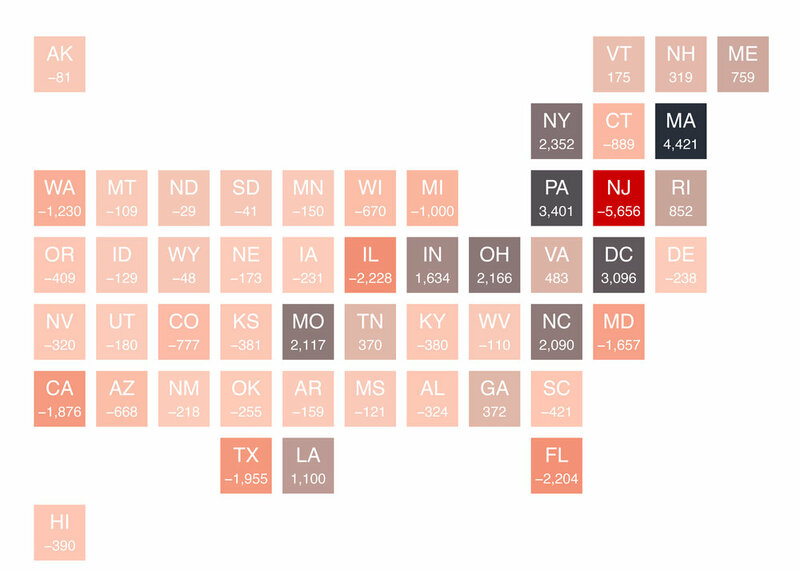 States with the greatest overall net loss in ‘brain drain’ leavers include: New Jersey (-5,656), Illinois (-2,228), Florida (-2,204), Texas (-1,955), and California (-1,876). New Jersey has long experienced ‘brain drain’ within its education and workforce sectors. Among recent New Jersey high school graduates who enrolled in an out-of-state ‘most competitive’ college in fall 2016, 23% enrolled in New York, 19% in Pennsylvania, and 14% in Massachusetts. And even though California is home to 12 ‘most competitive’ U.S. colleges, the state also experienced a net loss in ‘brain drain’ leavers. Among recent California high school graduates who enrolled in an out-of-state ‘most competitive’ college in fall 2016, 22% enrolled in New York and 19% in Massachusetts (proving to be exceptionally geographically mobile). The figure below displays the same net migration data points as above in a lollipop chart. The majority of states (28 out of 51, including DC) have between ± 500 students who in- or out-migrate to attend a ‘most competitive’ college. For these states, ‘brain drain’ is minimal. For states on either end of the chart, ‘brain drain’ poses an opportunity (or challenge) to advancing (or sustaining) the human capital of the emerging generation of residents. States that can attract talented college enrollees (or at the least prevent their homegrown talent from out-migrating) benefit from their skills and abilities, helping to ensure economic and intellectual well-being for all. The Program for the International Assessment of Adult Competencies (PIAAC) is a multi-country survey of adults, developed by the Organization for Economic Cooperation and Development (OECD), that measures skill proficiency in the domains of numeracy, literacy, and technology-based problem-solving. In addition to direct skills assessment, PIAAC also collects rich demographic, health, and employment data through an individual background questionnaire. Drawing from a small subset of education and demographic variables, the following indicators show trends in U.S. educational attainment across age cohorts, and within the millennial age cohort, by first-generation and underrepresented minority statuses. Attainment level reflects an individual's highest self-reported education qualification. For these analyses, educational attainment levels are presented with U.S. terminology, translated from the International Standard Classification of Education (ISCED) coding system in which PIAAC attainment data are reported. While PIAAC data allow for international comparisons, the indicators below reflect U.S. trends only. The figure below shows trends in U.S. educational attainment across age cohorts in ten-year bands. The youngest cohort presented (ages 25 to 34) represents millennials, a purposively oversampled population of the PIAAC survey. Across the four age cohorts, the most sizable differences in educational attainment appear at the high school and bachelor’s degree levels. 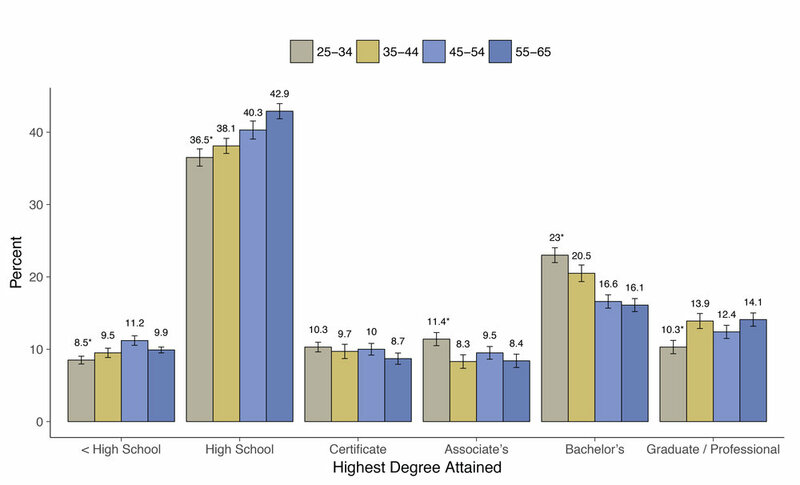 Across successive cohorts of U.S. adults, smaller shares of younger adults hold a high school credential as their highest education qualification, while an increasingly greater share hold a bachelor’s degree. Slightly greater shares of millennials (11%) also hold an associate’s degree compared to older age cohorts (8% to 10%). These analyses mirror national trends in increased college-going and degree attainment among younger U.S. residents. While career and technical education is a current policy priority at the federal and state levels, PIAAC data reveal that comparable shares of U.S. adults spanning four decades hold vocational certificates. These data, however, reflect the years 2012 and 2014, and it is unclear if greater shares of young adults have completed postsecondary certificates in the past few years. Older age cohorts outperform millennials in one regard: the share who hold advanced degrees, though this is likely a function of time. As millennials age and mature in their careers, they may continue to display a college-going disposition and attain a graduate or professional degree after the category’s age cap of 34. Data Source: PIAAC U.S. Household Survey 2012/14 public-use data file. Notes: Author's calculations using the repest package for Stata. Error bar represents one standard error above and below estimated value. 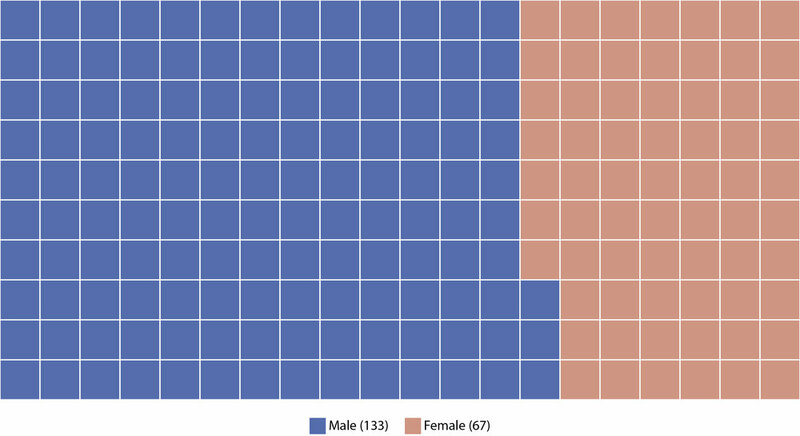 Asterisk indicates statistically significant difference in estimated value between youngest (25-34) and oldest (55-65) age cohorts within the same attainment level. Within the U.S. millennial population (ages 25 to 34), the PIAAC data reveal sizeable gaps in educational attainment between first-generation (FG) and continuing-generation (CG) students. First-generation status is operationalized as neither parent holding a postsecondary credential. The majority of FG millennials do not hold a postsecondary credential, as 57% count a high school credential or less as their highest education qualification. By comparison, fewer than one-third (30%) of CG millennials fall into these same lower attainment categories. At the other end of the spectrum, CG millennials far outpace their FG counterparts in the share who hold a bachelor’s degree (32% vs. 15%) or advanced degree (17% vs. 4%). At the sub-baccalaureate level, however, comparable shares of FG and CG millennials hold vocational certificates and associate’s degrees (10% to 12% range). These findings reinforce the widely known disparities in educational attainment that first-generation students face, as parents’ education level strongly correlates with their children’s own attainment. Data Source: PIAAC U.S. Household Survey 2012/14 public-use data file. Notes: Author's calculations using the repest package for Stata. Error bar represents one standard error above and below estimated value. Asterisk indicates statistically significant difference in estimated value between first-generation and continuing-generation cohorts within the same attainment level. PIAAC data also reveal that millennial-age “underrepresented minorities” (operationalized as individuals who self-identify as Black or Hispanic/Latino on the survey instrument) demonstrate lower levels of educational attainment compared to millennials who self-identify as White or Asian/Pacific Islander. Nearly two out of three Black and Hispanic millennials do not hold a postsecondary credential, with 63% holding a high school credential or less as their highest education qualification. By contrast, a significantly smaller share (37%) of White and Asian millennials fall into these lower attainment categories. As a group, White and Asian millennials far outpace their Black and Hispanic peers in the share who hold a bachelor’s degrees (27% vs. 13%) or advanced degree (13% vs. 5%). These data reveal deep disparities in educational attainment across racial/ethnic lines, even among the youngest U.S. adult age cohort. Data Source: PIAAC U.S. Household Survey 2012/14 public-use data file. Notes: Author's calculations using the repest package for Stata. Error bar represents one standard error above and below estimated value. Asterisk indicates statistically significant difference in estimated value between Black/Hispanic and White/Asian subgroups within the same attainment level. Though the above figure shows stark differences across combined racial/ethnic groups, there are likely within-group differences not captured by the relatively crude group classifications presented. While PIAAC remains a valuable data source, the international-focused survey can be limited in sample size, as there are only 2,100 millennials in the U.S. sample from which to disaggregate race/ethnicity and fine-grained educational attainment categories. Due to the relatively small cell size after data disaggregation, I elected to conceptualize and present the “underrepresented minority” group compared to peers who, on average, demonstrate higher levels of educational attainment. Rick Hess of AEI recently released his annual list of the 200 most influential education scholars in the U.S. Concurrent with the unveiling of the 2018 list, institutions including Penn and UCLA, among others, issued press releases celebrating the public scholarship and public recognition of their faculty. So who are these 200 university-based scholars at the forefront of education policy and practice? The following seven figures provide a descriptive snapshot of the illustrious body of academics who currently hold a spot on this coveted list. Two-thirds of the ranked scholars on the 2018 list are men (133) and one-third (67) are women. Despite the overall 2:1 ratio of men to women, eight of the top 10 spots went to women (with Linda Darling-Hammond of Stanford topping the list). Data Sources: 2018 RHSU Edu-Scholar Public Influence Rankings; Individual faculty websites. Nearly 80 percent of the 2018 edu-scholars have achieved the academic rank of full professor. Considerably smaller shares of associate professors (12 percent) and assistant professors (4 percent) made the list. Martin West of Harvard is the highest-ranked associate professor (No. 52), and Robert Kelchen of Seton Hall is the highest-ranked assistant professor (No. 54). Not all scholars are tenured or tenure-track faculty; the remaining 6 percent are university-based researchers or directors of research centers. Data Sources: 2018 RHSU Edu-Scholar Public Influence Rankings; Individual faculty websites and curricula vitae. Approximately one-third (72) of 2018 ranked scholars are currently affiliated with just eight institutions in the "Ivy+" category, which includes Brown, Columbia, Dartmouth, Harvard, Princeton, Stanford, U. Penn, and Yale. Harvard and Stanford lead the pack with the most number of ranked scholars (24 and 20, respectively). Overall, nearly 3 out of 5 scholars are affiliated with private institutions. The remaining 40 percent represent public institutions, though more than 75 percent of those at public institutions are affiliated with just 17 public flagship universities. Among flagships, UCLA boasts the most number of ranked scholars (13) followed by Berkeley (10). 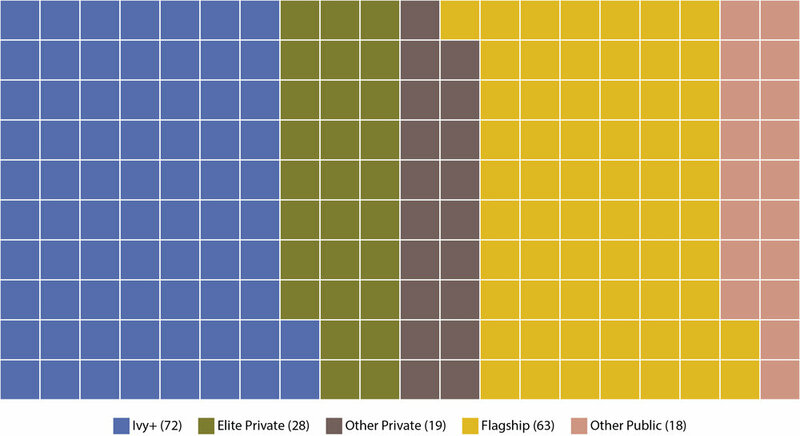 Fewer than 10 percent of ranked scholars are affiliated with non-flagship public universities. Sarah Goldrick-Rab of Temple University is the highest-ranked scholar among this group (No. 7). Nearly all ranked scholars hold either a PhD (85.5 percent) or an EdD (10.5 percent). Thirteen of the 21 EdD holders received their degree from Harvard. Six individuals to make the 2018 list hold professional degrees as their highest degree (4 law, 2 medicine). One individual holds the Master of Public Administration degree, and one holds a B.A. from Harvard College. The 200 ranked scholars represent a wide array of disciplinary training. More than one-quarter (28 percent) received their highest degree in the field of education. This broad categorization includes subfields such as curriculum and instruction, educational administration, and higher education. Nearly 20 percent of scholars received PhDs in economics or the economics of education. A similar share (17 percent) received doctorates in psychology or educational psychology. Approximately 10 percent received doctorates in sociology or sociology of education. Approximately 8 percent have their highest degree in the fields of government/political science (17) and public policy/education policy (15). Only two ranked scholars (1 percent) hold PhDs in anthropology and history, respectively. Note: Degree field information was retrieved from individual faculty members curricula vitae. Listed degree program on CV may not accurately reflect an individual's academic coursework or disciplinary perspective post-graduation. Only field of highest degree earned (typically doctorate) was considered. For five individuals, degree field was not listed on CV and an Internet search was not able to recover this information. Where did the ranked scholars receive their academic training? More than half (107) of all 2018 edu-scholars received their highest degree from just 13 Ivy League or elite private institutions. Thirty-four individuals received their highest degree from Harvard, and 18 from Stanford. 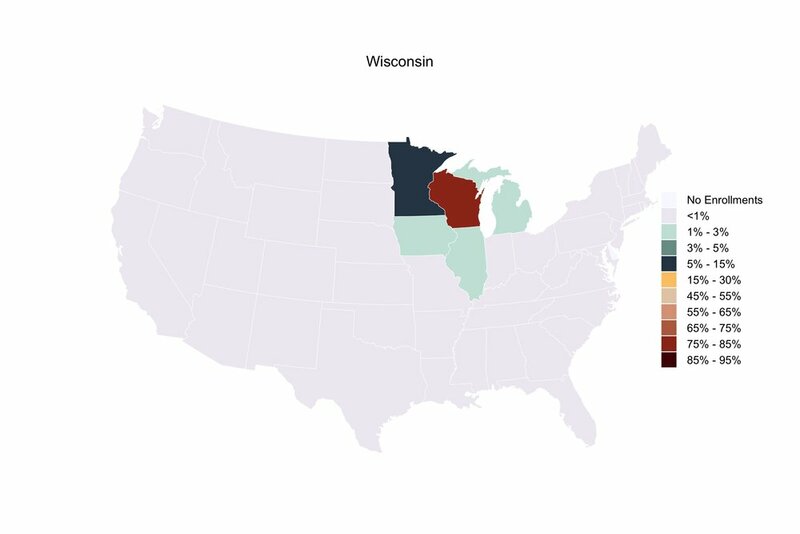 One-third of ranked scholars received their highest degree from public flagship universities (with UW-Madison leading flagships with 9). Only 10 percent of scholars received their highest degree from non-flagship public universities. Seven individuals received PhDs from international universities. How did scholars' 2018 rankings compare to 2017? Approximately 40 percent of 2018 scholars remained in the same position or moved up the rankings from 2017. One-third remained within plus/minus 10 spots from their 2017 position. The scholar who realized the greatest positive rank change was Daniel Koretz of Harvard, moving from No. 152 in 2017 to No. 20 in 2018. The 2018 list saw 13 individuals who did not appear on the 2017 list, with Raj Chetty of Stanford ranking the highest (No. 14) among this group. Data Sources: 2017 RHSU Edu-Scholar Public Influence Rankings; 2018 RHSU Edu-Scholar Public Influence Rankings. 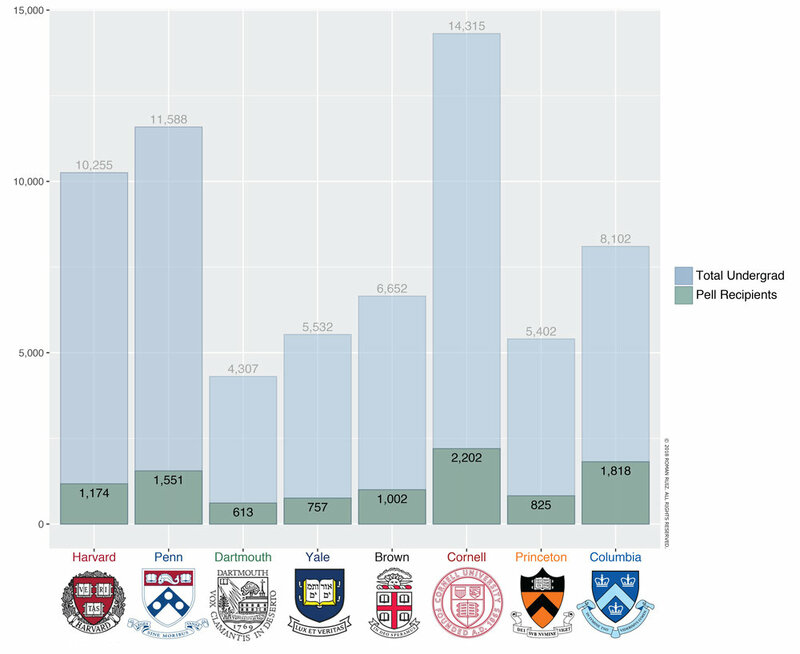 How many low-income students attend Ivy League colleges? The figure below shows the total number of undergraduates and Federal Pell Grant recipients (a common proxy for 'low-income' status) enrolled in Ivy League colleges and universities in academic year 2015-16. Undergraduate enrollments vary widely across institutions, ranging from 4,307 at Dartmouth to 14,315 at Cornell. Similarly, the number of Pell Grant recipients enrolled at each Ivy League institution varies, from 613 at Dartmouth to more than 2,000 at Cornell. In total, fewer than 10,000 Pell Grant recipients attended Ivy League colleges and universities in 2015-16. Data retrieved from the IPEDS Data Center. The figure below translates the above enrollment counts into the share of Pell Grant recipients at each Ivy League institution. Harvard has the smallest share of Pell Grant recipients represented in its undergraduate student body (11 percent), while Columbia has the largest share (22 percent). For most Ivy League institutions, 14-15 percent of the undergraduate class is comprised of Pell Grant recipients. What are the graduation outcomes for Pell Grant recipients enrolled in Ivy League colleges? 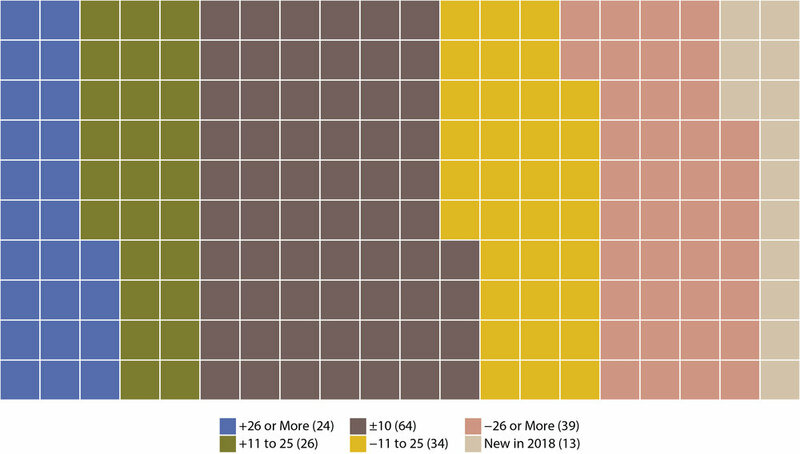 The figure below shows the 6-year bachelor's degree completion rates for Federal Pell Grant recipients who began as first-time, full-time bachelor's degree-seeking students in fall 2010. Based on this cross section of available data, the University of Pennsylvania (Penn) exhibits the lowest Pell graduation rate (91 percent), while Yale exhibits the highest (98 percent). Author's calculations. Data retrieved from the IPEDS Data Center. *Preliminary data reported in IPEDS show zero FTFT Pell Grant recipients enrolled at Columbia in fall 2010, therefore no graduation rate could be calculated. Of those who leave their home state for college, where do they go? The diagram below displays the origin and destination (by state) of U.S. first-time undergraduates in fall 2014. Over 500,000 undergraduates enrolled in an out-of-state college in that year. 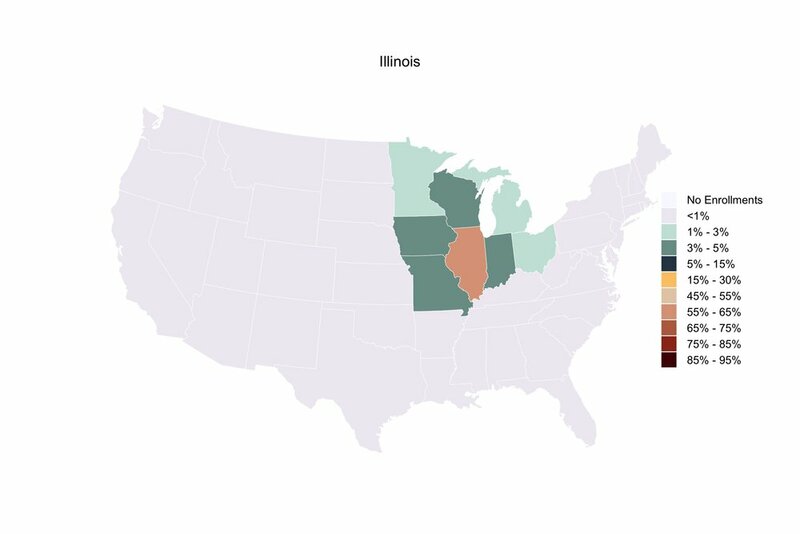 The states with the largest number of students leaving include California (42,152 students or 8 percent of all leavers), New Jersey (35,542 students), and Illinois (33,973 students). 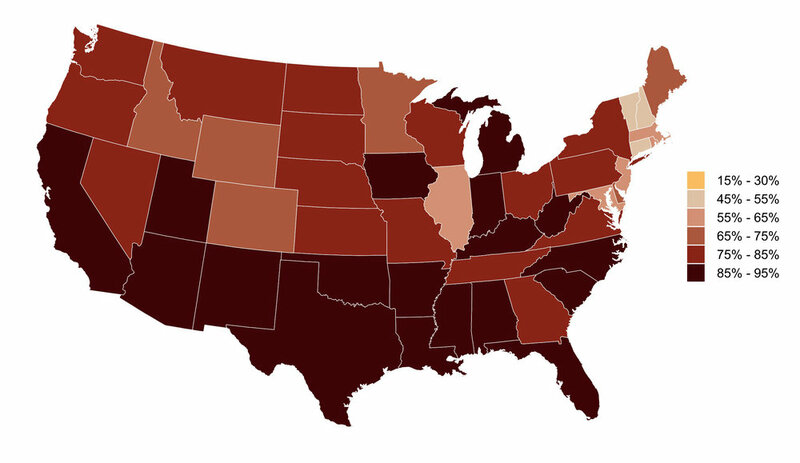 Students who out-migrate typically travel to a nearby state. For example, among those who left New Jersey to attend college, 28 percent enrolled in a Pennsylvania college and 19 percent enrolled in a New York college. Author's calculations. Data retrieved from the IPEDS Data Center. 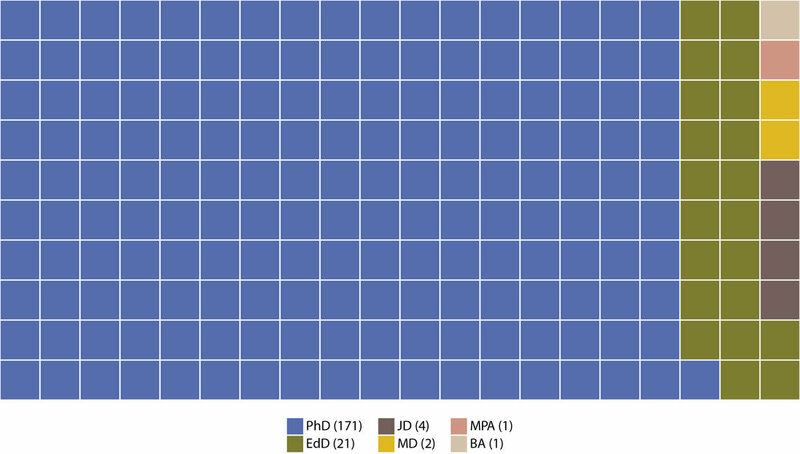 The diagram displays college out-migration counts for first-time degree/certificate-seeking undergraduates in fall 2014. In-state enrollment counts are not presented. The data reflect U.S. residents and U.S. postsecondary institutions (i.e., 50 states and DC). What is the relationship between an institution's economic diversity and graduation outcomes for low-income students? How does this relationship vary by institutional selectivity? The graph below displays the relationship between an institution's economic diversity (measured as the percentage of undergraduate students who receive a Federal Pell Grant) and six-year bachelor's degree completion rates for Pell Grant recipients. Generally, as the share of low-income students increases, the six-year bachelor's degree completion rate decreases (as evidenced by the downward slope). Overlaid in color is the institutional selectivity (measured by Barron's Admissions Competitiveness Index). 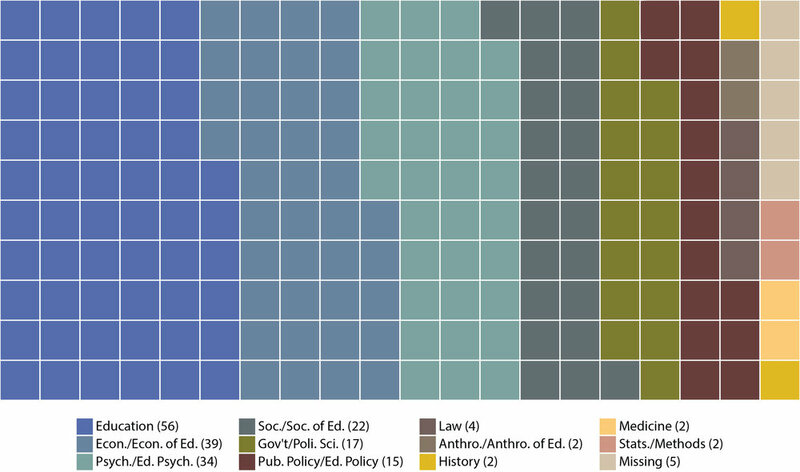 The vertical position of the colored dots and lines, particularly within the higher selectivity categories, shows the economic stratification at U.S. four-year colleges. The most selective institutions typically serve fewer low-income students relative to their undergraduate enrollments, but those who are able to gain admission exhibit exceptionally high completion rates. Author's calculations. Data retrieved from the IPEDS Data Center and Barron's Profiles of American Colleges 2016. Completion rates reflect the share of Federal Pell Grant recipients who began in fall 2010 and completed a bachelor's degree at the same institution by summer 2016. Institutions represented include Title IV U.S. four-year public and private, not-for-profit institutions that are ranked by Barron's. Associate institutions that grant bachelor's degrees and special focus institutions are not included. In which types of postsecondary institutions are students enrolled? In fall 2015, more than 17 million undergraduates enrolled in U.S. colleges and universities. The vast majority (76 percent) attend public institutions, with enrollments nearly evenly divided between four-year and two-year colleges. 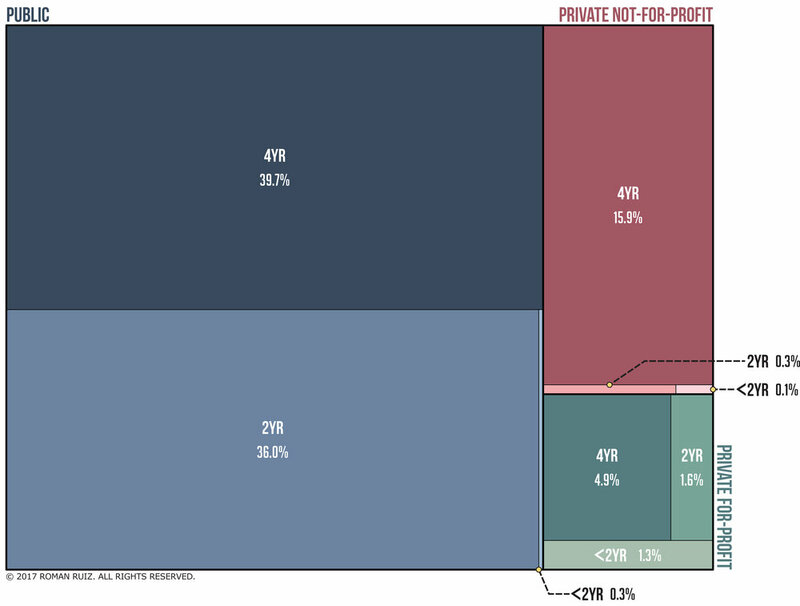 Relatively few undergraduates (8 percent) attend for-profit institutions. Of those who attend for-profits, the majority attend four-year institutions. Overall, approximately 60 percent of undergraduates enroll in four-year colleges, and nearly 40 percent attended 2-year colleges. Very few (less than 2 percent) attend less-than-two-year postsecondary institutions. Author's calculations. Enrollment counts reflect all Title IV U.S. postsecondary institutions in academic year 2015-16. Data retrieved from IPEDS Data Center. What factors do high school graduates consider when choosing the college in which they enroll? The graph below displays 12 college choice considerations and the level of importance a nationally-representative sample of high school graduates assigned to each when they made their college choice in 2013. The vast majority of college enrollees reported that academic quality or institutional reputation was very important in selecting their choice institution. Academic program offerings and cost of attendance were also important considerations. Conversely, for most high school graduates who immediately enrolled in college in fall 2013, the opportunity to play sports and online course offerings were not important considerations in making their college choice. Where do college-educated U.S. residents live? The map below displays aggregate college attainment levels for working-age adults by U.S. county. College attainment levels vary by geography, with many counties in the Mid-Atlantic region exhibiting high levels of attainment, whereas many counties in the Southeast exhibit low levels. Even within states with historically low levels of college attainment, there remain pockets with large shares of college-educated adults (typically near state capitals and other large cities). Author's calculations. American Community Survey (ACS) 5-year estimates. Data retrieved from Social Explorer.